We live in an era where entertainment dominates almost every facet of life. Sporting events, new programs, even religious meetings can veer away from their intended purpose to become entertainment. And yet, while entertainment rules, we don't see much showmanship anymore. Sure, there's plenty of hype around today, but we don't see the hucksters of yesteryear who would do whatever it took to sell their product. Legendary film producer Roger Corman knew the value of a good title and even if the movie didn't deliver on the title's promise, it would at least get butts in the seats. 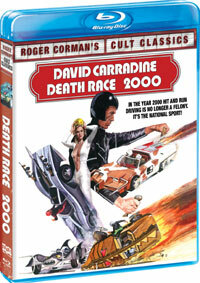 And to find a good title from the Corman collection, one need look no further than Death Race 2000. Death Race 2000 is set in a future where America has gone through drastic changes (the leader, Mr. President (Sandy McCallum) has residences in other countries!). The most popular activity in this world is the annual Trans-Continental Road Race -- an event where drivers not only try to be the first to drive cross-country, but also hope to rack up points by running over pedestrians. The five contestants are; Calamity Jane (Mary Woronov), Matilda the Hun (Roberta Collins), Nero the Hero (Martin Kove), Machine Gun Joe Viterbo (Sylvester Stallone), and Frankenstein (David Carradine). Frankenstein is a past winner and crowd favorite, and he's been disfigured due to many accidents. Each driver is accompanied by a navigator and for this race, Frankenstein has a new one, Annie (Simone Griffeth). Once the race begins, each driver takes a different route, as they attempt to win. But, along the way, everyone will learn that not everything is as it seems. The 70s were filled with films from many genres, and two of the more popular ones were car-chase movies and science-fiction. Leave it to Roger Corman to combine the two in this low-budget classic. While many of Corman's films are cheap and one-dimensional, Death Race 2000 works on several levels. First and foremost, this is an action film. While the car racing footage doesn't dominate the movie (that would have been too expensive), we get a good amount. The focal point of this part of the movies are the cars themselves. Made from old Volkswagens and on a very slim budget, each of the five cars have their own personality and, I hope I don't sound too fanboyish here, each one is very cool. I can't help but wonder if Shout! Factory every considered packaging this edition with Matchbox-sized replicas of the cars. I would have ponied up the dough for that. While some of the film comes off as dated and cheap-looking today, those cars are still the stars. Underneath the racing movie is a sharp political satire. Director Paul Bartel was known for his wicked sense of humor and his filled the movie with it. Keep in mind that the film was made at a time when many Americans distrusted The President due to the actions of Richard Nixon. Thus, in Death Race 2000, we have a leader who is treated more like a religious figure. As far as we can tell, the race is staged solely for entertainment purposes, as the Mr. President is, as he puts it, "Giving the people what they want". Those who oppose the race are not unlike the 70s radicals who protested the Vietnam War. We are also treated to TV announcers like Junior Bruce (Don Steele) and Grace Pander (Joyce Jameson) (what a great character name) who put a positive and fun spin on the bloodshed and violence. The funny thing about Death Race 2000 is that the true nature of the race isn't revealed for 15 minutes. So, if you didn't know that this was a movie about running over people, then you are in for a big shock. The most interesting thing about Death Race 2000 is how well the film has held up. OK, those matte paintings are abysmal and the costumes don't look great, but much of the movie still works. Of course, it's fun to look back and see Sylvester Stallone in something like this, and one must remember that David Carradine was hot off of Kung Fu at the time. Also, look for Fred Grandy, future star of The Love Boat and politician as Matilda's navigator. Again, the cars still look great and for a film of this genre, the story has some nice twists and turns. In short, Death Race 2000 is a hoot and it's probably one of the most fun vehicular homicide movies that you'll ever see. If nothing else, it makes you realize just how bad the remake, Death Race, really was. Death Race 2000 is willing to kill its own pit crew for points on Blu-ray Disc courtesy of Shout! Factory. The film has been letterboxed at 1.85:1 and the Disc contains an AVC 1080p HD transfer which runs at 27 Mbps. Given the film's age and obscurity, this transfer looks pretty good. The image is fairly sharp and clear, showing only mild grain at times. There are some shots which show black dots and cuts in the film, but for the most part, it is free from defects from the source material. The colors look very good, as the movie isn't afraid to show pastels. The level of detail is pretty good as well. The Disc carries a Dolby Digital 2-channel stereo audio track which runs at 48 kHz and a constant 448 kbps. The track provides clear dialogue and sound effects. When compared to how good the movie looks, the audio is a disappointment, but it fits the film. We don't get any sort of dynamic effects here, but the dialogue is always audible and the funky in-film music sounds fine. The Death Race 2000 Blu-ray Disc is loaded with extras. We begin with an AUDIO COMMENTARY from Assistant Director Lewis Teague and Editor Tina Hirsch. Next, we have a second COMMENTARY with Roger Corman and Mary Woronov. "Playing the Game: Looking Back at Death Race 2000" (12 minutes) is a retrospective featurette which contains comments from Corman, writher Charles Griffith, and New World alum Joe Dante. It contains clips from the film and interesting anecdotes about the production. The producer and an old-school film critic discuss the movie in "Leonard Maltin Interviews Roger Corman" (6 minutes). "Designing Dystopia" (12 minutes) examines the "futuristic" look of the movie and the cars. Art Director B.B. Neel discusses the locations and sets, while James Powers and Dean Jefferies give details about how the cars were built. "Ready to Wear" (15 minutes) is an interview with costume designer Jane Ruhm, who describes how she created the look on a low budget. "David on Death Race" (4 minutes) is an excerpt from a 2008 interview where Carradine discusses the movie. "Start Your Engines" (12 minutes) is an interview with author Ib Melchior, on whose short story the movie is based. He discusses how his tale varies from the movie. "Killer Score" (11 minutes) features composer Paul Chihara commenting on the score. "Poster and Still Gallery" offers lobby cards from around the world. The extras are rounded out by a series of trailer, featuring the THEATRICAL TRAILER, including the trailer with commentary by John Landis (which is really funny), three RADIO SPOTS, and a TV SPOT. Review by Mike Long. Copyright 2010.